If you were to take an underwater journey through Pen Llŷn a’r Sarnau, within half an hour you could pass by rocky shores covered in limpets, hermit crabs and gobies before swimming over a sandy seabed alive with flatfish, dragonet fish and sea mice. You could take a peek into dark sea caves, with walls carpeted in anemones and baked bean sea squirts. You might see a conger eel peeping out, or a grey seal having a rest! You could pass through the deep open water to find ten-meter long basking sharks sieving plankton with their huge mouths, and dolphins and porpoises leaping above the waves. Further on, bubbling reefs make the water fizz with gas bubbles, before you climb out of the water onto one of the rocky Sarnau reefs or relax with baby bass and mullet in the creeks and channels of the coastal estuaries. Because of all of these varied and unusual underwater landscapes, type of seabed (habitat), and the amazing animals and plants that live here, Pen Llŷn a’r Sarnau is protected as a Special Area of Conservation (SAC). Special Areas of Conservation are chosen because they have some of the best examples in Europe of special wildlife areas, creatures and plants that need looking after. Estuaries are made up of a number of different habitat types. They are defined as the part of a river valley extending downstream from the limit of brackish water and subject to the tide. Estuaries have typical characteristics including a gradient of salinity from freshwater in the river to increasingly marine conditions towards the open sea, input of sediment from the river and seawater coming into the estuary and variable shelter from wave action and tidal flows within different parts of the estuary, with extensive intertidal sediment flats and sediment-filled subtidal channels often developing in areas of low current flow. The three main estuaries of Pen Llŷn a’r Sarnau are the Glaslyn Dwyryd, the Mawddach and the Dyfi. All three of these estuaries are classified as bar-built estuaries that characteristically have a sediment bar across their mouth and are partially drowned river valleys that have subsequently been inundated. Pen Llŷn a’r Sarnau has some of the best examples of this type of estuary in the UK. Grey seals Halichoerus grypus are among the rarest seals in the world – the UK population represents about 40% of the world population and 95% of the EU population. The Pen Llŷn a’r Sarnau SAC contains a number of important grey seal haul-out sites, both pupping and non-pupping, which are dependent on supporting habitat. The exact habitat requirements of the grey seal are unknown – seemingly suitable habitat is often not occupied by seals. The habitats used by grey seals in the SAC and elsewhere in North Wales are intertidal rocky outcrops, rock and boulder/cobble beaches, sea caves that are tidally exposed, and occasionally sandy beaches and tidally exposed sandflats. 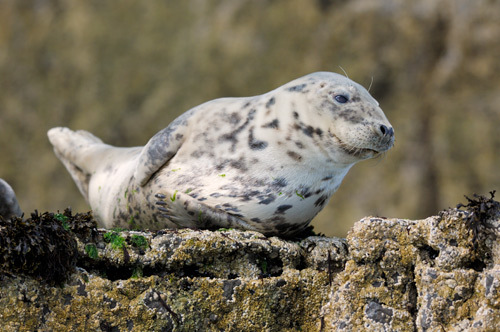 For north Wales in general and specifically within the SAC, sea caves are a major supporting habitat with approximately 67% of seals pupping within caves during 2002 (Westcott, et al., 2003) and the remainder being born on beaches. The non-pupping haul out sites are concentrated around the NW of the SAC and include Ynys Enlli (Bardsey Island). One of the key considerations for the conservation of the grey seal within the SAC specifically, and as part of an extended population in North Wales and beyond, is disturbance of breeding and haul-out sites by human activity. With very few exceptions, seals within the SAC choose to haul-out on rocky shores or in sea caves currently remote from access by humans. Large shallow inlets and bays are usually defined as large indentations of the coast where the influence of freshwater is generally limited. They are generally more sheltered from wave action than the open coast and are relatively shallow, usually averaging less than 30m in depth. The large shallow inlet and bay of Pen Llŷn a’r Sarnau is the embayment known as Tremadog Bay at the northern end of Cardigan Bay. Tremadog Bay is a relatively shallow embayment with an average depth of less than 20m. It is also an unusual embayment in terms of the nature and variety of its seabed and coastal habitats and wildlife, as well as in terms of some of its physical characteristics. The number of otters within the SAC is not known, but there is evidence that shows that otters use areas of the coast throughout the whole site. Information from surveys shows there is otter activity around the estuaries of the SAC with indications of regular otter usage of the Glaslyn/Dwyryd and Dyfi estuaries, as well as signs of otters (e.g. spraints) by the Mawddach estuary and in mine adits along the estuary. Information from surveys, sightings, and road casualties suggest that the Soch, Rhydhir, Erch, Dwyfor, Artro and Dysynni rivers are all now used by otters. There is also evidence of otter use of tidal reaches, for example, otter signs are found regularly at Broadwater on the Dysynni River. Whilst it may be considered that they are more commonly found in and around the estuaries, a study of the Llyn Peninsula in 2002 found otter signs within 1km of the shore at 8 out of 10 sites surveyed. The SAC contains important potential feeding areas for otters. Coastal otters can hunt as far as 100m offshore in water over 10m deep, but most feeding is done much closer to shore in water less than 3m deep. The main hunting areas will be largely determined by the habitat preferences of the prey species. Otters are likely to be able to take advantage of seasonally abundant food sources. It is also likely that otters are not wholly dependent on the coast for food and that they also feed in adjacent rivers. The reefs of Pen Llŷn a’r Sarnau are extremely varied and support a very wide variety of communities of marine animals and plants reflecting the broad range of physiographic factors around the site as wave action, tidal streams, variation in sea bed type, scour regimes, water clarity and variation in water depth. The term reef can be applied to many different structures that include reefs formed of rocks and stones to biogenic reefs that are formed from living creatures. Each type of reef supports a different community of animals.